Prominent & Leading Manufacturer from Thane, we offer bell furnace. 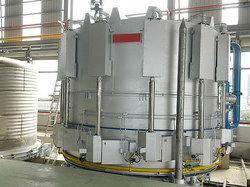 We are the prominent organization of this domain engaged in offering a wide spectrum of Bell Furnace. This oven is loaded with several quality features and specifications suitable for heavy usages at various industries. The offered oven is manufactured using stainless steel body sheet coated with fire and heat resistant paint. Furthermore, it contains a microcomputer digital system that controls the heat and the circulation of temperature in a moderate way.